Welcome to the lands that you brought you poutine, Ryan Gosling and peanut butter. Are you ready for an eight-day extravaganza of #epic proportions? Visit cities old and new as we wander the Maple Trail from the USA to Canada, calling at the red bricks of Boston, the fairytale spires of Old Quebec, the buzzing nightlife of Montreal and the foodie paradise that is Toronto. Make new friends, collect masses of memories and enjoy what this corner of the world has to offer. 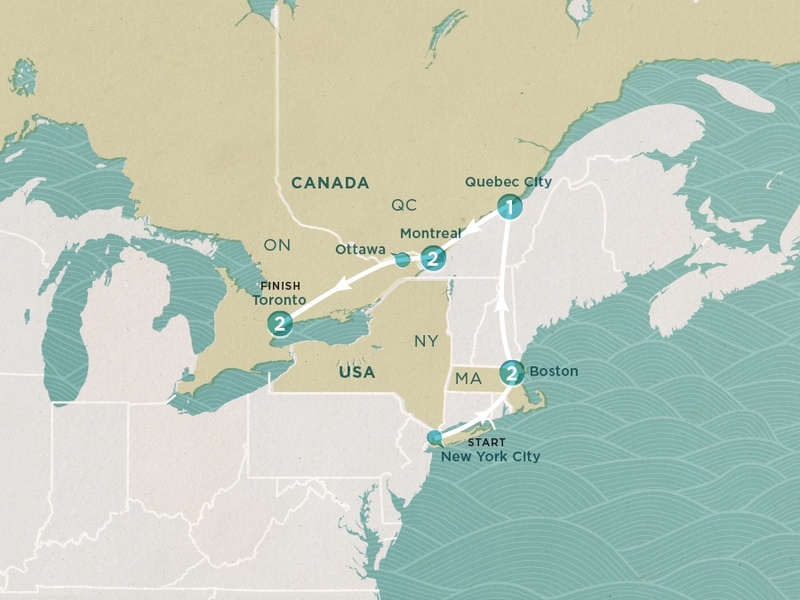 Say YES to Boston – our first stop on this epic maple-filled adventure. Get friendly with ‘Beantown’ on a driving tour before tucking into a slap-up dinner with the crew. Spoiler alert: guaranteed good times ahead. Boston is all about history, sports and, most importantly, food (seafood chowder = to die for). With a free day to take on the city, you could hit a home run with an optional Fenway Park tour or roll through Boston on an optional bike ride. Buh-bye Boston! We’re off to the mega metropolis that is Quebec. Perched on a cliff that towers over the St Lawrence River, Quebec City is old school Europe in the middle of North America. Get goosebumpy on an optional ghost tour tonight (if you dare). Get your last fix of Quebec this morning – we're out of here after lunch. Then, it’s up and onwards to Montreal. Did we mention there’s a ‘city’ underneath this city? Yeah, you read that right. Tonight, check out Blvd St Laurent for a taste of Montreal’s famed nightlife. Today, it’s all you. If you’ve got itchy feet, you could hike up the mountain that gave Montreal its name – or you could always hit up an optional food tour (hello chocolates, vegan food and St Viateur bagels) or jet boating tour (don’t forget to hold onto your hat). The short story? You won’t run out of things to do. A quick stop in the nation's capital before we move on to Toronto and the breezy Lake Ontario. We’ll hit the streets on a walking tour and get to know the city a little better before we let you loose to do as you please. FYI: Kensington is where the hipsters hang, so you’re bound to have a good time. Fact: Toronto is frequently dubbed one of the happiest places in the world. Your mission today is to find out what makes this place so damn great. With over 8,000 restaurants and counting, it could be the yummy food that keeps the good vibes flowing – or maybe it’s the crowd-pleasing Ice Hockey Hall of Fame or CN Tower? You decide. Cram in one last drizzle (or more?) of maple syrup, because after breakfast it’s time to wrap things up, eh?